Pork marinated in Mama Sita’s Tocino Mix then boiled and fried/grilled until tender. Tip: You can also cook the pork on a lightly greased, very hot electric or charcoal griller. 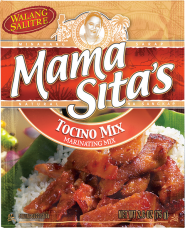 Sprinkle Mama Sita’s Tocino Mix evenly over the pork. Mix thoroughly for at least 5 minutes. For better results, let stand for 1 hour. Place meat in a frying pan and pour just enough water to cover the meat. Cook over medium heat until the fat is rendered and fry in its own fat.